Among the Dakota people, gifts from the many bodies of water nourished our existence: Mni Wiconi (Water is Life) is a phrase that still embodies this philosophy. 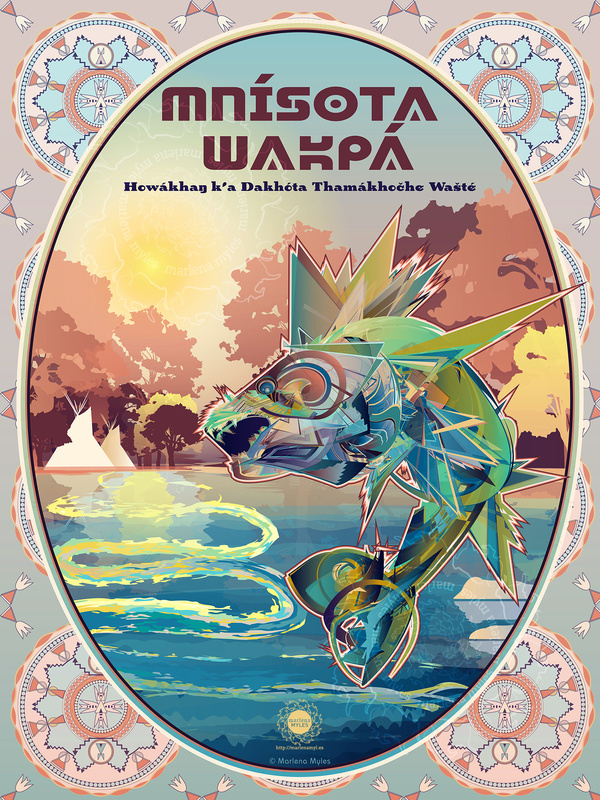 The Mnisota Wakpa serves as the namesake for our state “Minnesota” and is translated as Clear Waters, reflecting the sky. Many historical villages were along the Mnisota Wakpa and Dakota communities still thrive along these waters today. 18″ x 24″ Posters are $15. Please click the link below to choose your size. Thank you. The Howákhaŋ is considered the “holy grail” of fishes in Minnesota. However, with the way pollution has ruined many of southern Minnesota’s waters, it is importance the fisherman and conservationists work together to clean up the waters so the walleye can continue to feed all people. The best way to maintain walleye numbers is to protect the variety of lakes and streams they inhabit through existing laws limiting pollution and regulating reservoir and tailrace water levels. Shoreland zoning and related laws aid walleye and other fish by controlling lake and river shoreline development and protecting aquatic plants that walleye or forage fish use for cover. It is particularly important to protect rocky spawning shoals from pollution and sedimentation. From the MN DNR walleye management website.